The Blues started the game very brightly, looking determined to end their ongoing collective goal drought. Cesar Azpilicueta was inches away from connecting with a corner at the far post and Willian dragged a shot wide before Danny Drinkwater hit the bar for the home team. The bright start didn’t continue though, and soon Norwich were having chances of their own. The first half drew to a close with the game in the balance, and with the Championship side growing in confidence. In the second half it looked as though it might be the same old story for a while, with Michy Batshuayi looking particularly isolated and frustrated. But sure enough, from a nothing throw in down the left, the Belgian found himself on the end of Kenedy’s cross to fire home and give Chelsea the lead. From that point on the game opened up and both sides had some good chances, but a lack of quality on both teams meant that there were no more goals until the very last minute, when Norwich scored from a header to send the game to extra time. In extra time they did well and made chances, especially once Eden Hazard came on, but after Willian’s obvious penalty was denied, it seemed things would never go the way of Conte’s men. 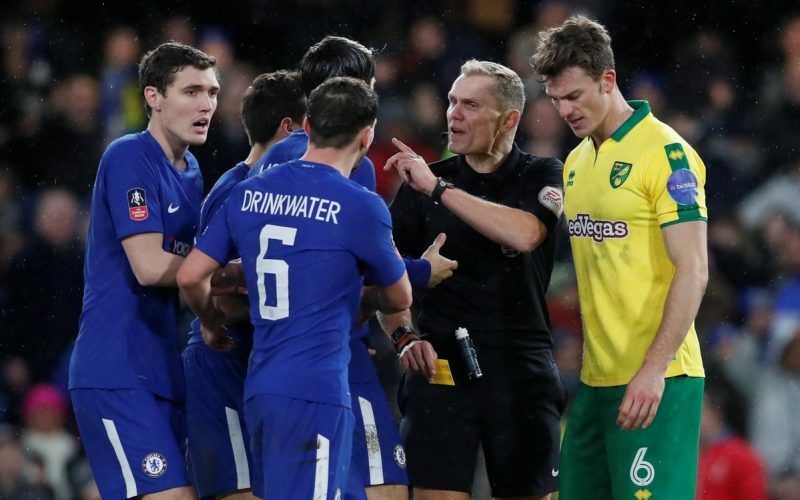 First Pedro was sent off for a second yellow, and then Morata was given two cards in quick succession for diving and complaining about it to the referee. The drama peaked in a penalty shootout, which saw the Blues angrily net all five of their efforts to put themselves into the fourth round – just about.